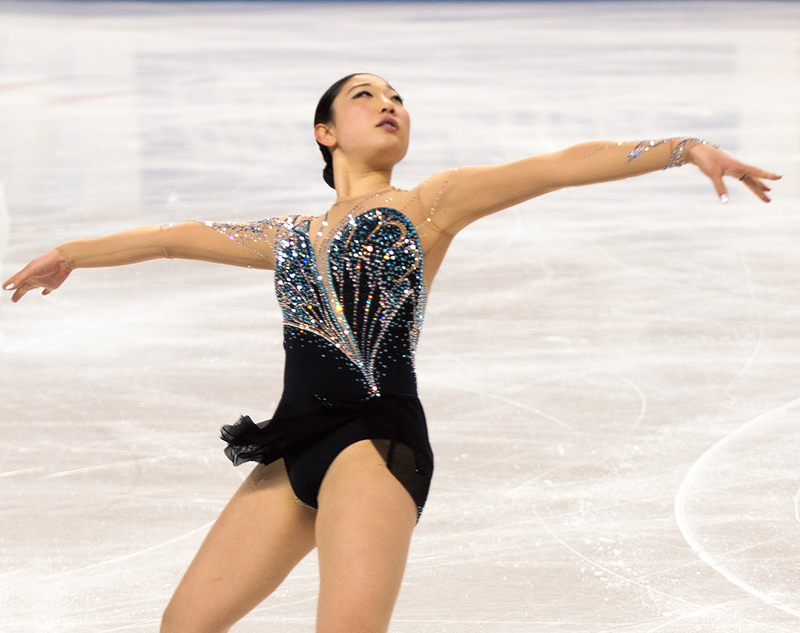 In 2008, Mirai Nagasu became the first skater to win the junior and senior ladies’ national titles in consecutive years since Joan Tozzer in 1937 and 1938. She also became the second-youngest American senior ladies champion in history, after Tara Lipinski. Nagasu represented the U.S. in the Vancouver Olympics in 2010, placing 4th, and at the 2010 World Championships, finishing 7th. Since then, the now 22-year-old has not made a return trip to Worlds, although a bronze medal at the 2011 Four Continents Championships was a highlight. In 2014, after winning the bronze medal at the U.S. Championships, U.S. Figure Skating awarded the third position on the Olympic team to Ashley Wagner. Last season, after a placing a solid fourth in the short program at Nationals, Nagasu crashed into the boards, injuring her knee (the posterior cruciate ligament was torn). She would finish in 10th place. However, Nagasu is back and she’s already made it to the top of a podium. This summer, Nagasu won the 2015 U.S. Collegiate Championships. She finished in second place in the free skate and fifth overall at Nebelhorn Trophy in September, and will compete at Ice Challenge in Graz, Austria at the end of the month. Recently, Nagasu talked with Figure Skaters Online about the U.S. Collegiate Championships, college, the upcoming season, and her triple Axel. She also shared a message to her fans with us. Figure Skaters Online (FSO): How is school? Why did you decide to enroll full-time? Mirai Nagasu (MN): I was not planning on being a full-time student this semester. I went to the U.S. Collegiate Championships and won a scholarship. In order to receive the scholarship funds, I had to attend full-time. I am working to balance my training and being in school. FSO: What are you studying? MN: International Business. I am not sure if this will be my final major. I am currently taking general classes and have not started any business classes. One class is Communications in the Workshop and Writing for Business to help me better present myself. FSO: How are you balancing skating and school? MN: In the summer, it was really hard and I was not getting much sleep. Now that it is fall, it has been much more manageable. Now whenever I have breaks at the rink, I am usually doing homework. In the summer, two months, I had to cram so much together, but now it is more laid back. FSO: What was it like to compete at the U.S. Collegiate Championships? There were other names that were recognizable competing, like Max Aaron and Richard Dornbush. MN: It was much more relaxed than a normal competition. We stayed at the house of a friend who is also a coach and recently coached (now retired) Stephen Carriere. Overall, I had a really good time. Collegiates is designed toward college students. So many of us “starving” students are financially stretched, so we didn’t bring our coaches. We went to compete and get our programs out there. My friend, Alex (Alexander Johnson), put me on the ice. It is always comforting to have a good friend nearby. FSO: What did it feel like to win? MN: It was so rewarding. I wanted and needed that scholarship because school is so expensive. I was working hard to earn that medal. FSO: How is the Collegiate Championships different from U.S. Nationals? MN: The organizers did such a great job and were accommodating with our schedules so we didn’t have to practice early mornings. As skaters, we appreciated that flexibility. They put together a great event complete with a cute little Kiss and Cry. FSO: You are practicing your triple Axel. How is it coming along? cheat on the landing, so we’re aggressively training to get the cheat out. FSO: How tiring is landing a demanding jump like the Axel? MN: Skating is a difficult sport, but I am getting stronger and building my confidence and hopefully I will be able to land my triple Axel in competition. For now, we are playing it one step at a time. FSO: Do you think there is too much emphasis on the triple Axel? How do you determine, in your mind, when you are at the point to add it into a program? MN: Even a hard fall on a triple Axel could demonstrate to the judges I have been training, and with the points for attempting the jump, it would be worth considering adding it in. FSO: You received one Grand Prix assignment (NHK Trophy). Thoughts on that? MN: I am disappointed, absolutely, but with withdrawals, I plan on working hard at home and improving so I am prepared in case I get a second one. FSO: This is your second season with Tom (Zakrajsek). How has training been at high altitude compared to California. What else is different? MN: Colorado Springs is very busy. There are a lot of good skaters and they want to get the job done. It makes for a strong environment and training at a high altitude is always better to increase stamina. It isn’t fun on my lungs, but when it comes time to compete I’ll have that extra confidence. FSO: Are you missing Los Angeles? MN: I miss my parents, but this was the right move for me. There are more opportunities for ice time and everything is closer so I’m not spending time commuting three hours a day. I’m saving time and that equates to money. I feel I am benefiting by training out here. Fortunately, I rent from a family and they help me. I think I would get lonely if I was living alone. They are a great support around me. FSO: Can you talk about your programs for this season? MN: I am skating (long program) to The Great Gatsby film soundtrack. I also have a bit of Beyoncé and will.i.am so I am going a non-traditional route since both programs have lyrics. I know some people prefer not to change, but I am hoping to sway their opinion with the strong pieces of music I have chosen. FSO: What is the most challenging part of each program? MN: We upped the ante of the difficulty of my jumps. In the last two years, to even attempt those jumps it took a lot out of me. I know I will be more successful this year. FSO: What are your goals now? MN: Last year, I worked so hard, but unfortunately, I had a freak accident (at Nationals). So this season, I want to showcase how much I’ve improved. I have really cleaned up my jumps and even with the pressure of competition, I can perform as I practiced them. FSO: If you could be a super hero, what one would you be? MN: I am into Marvel, the movies, and definitely Iron Man is a favorite because he accomplishes what he sets out to do. If I could choose, I would be Vision. He has the ability to fly. FSO: You are an animal lover. What breeds do you have? MN: I have one dog and his name is Lincoln. He’s a pugalier. I adopted him from the Humane Society which I feel is very important because all the animals need a home. There’s also a golden lab in the house. FSO: Why the name Lincoln? MN: When he was sitting in the kennel, although he was skinny, he was so regal and had great posture. He needed to be named after a president especially after the monument in Washington, DC. FSO: Anything else you want to add? MN: I just want to let everyone know I am so appreciative, and that my career hasn’t been as strong as it initially began, but for my supporters, I am so grateful. I am so thankful.